Mariana Henke, 18, of Fort Collins performs during the Modern Band Summit in Fort Collins. The summit, put on by Little Kids Rock, helps train teachers how to incorporate modern music into the classroom. FORT COLLINS (AP) – Mariana Henke stood barefoot while strumming her black guitar on stage. She played several original songs as teachers from across the country listened. 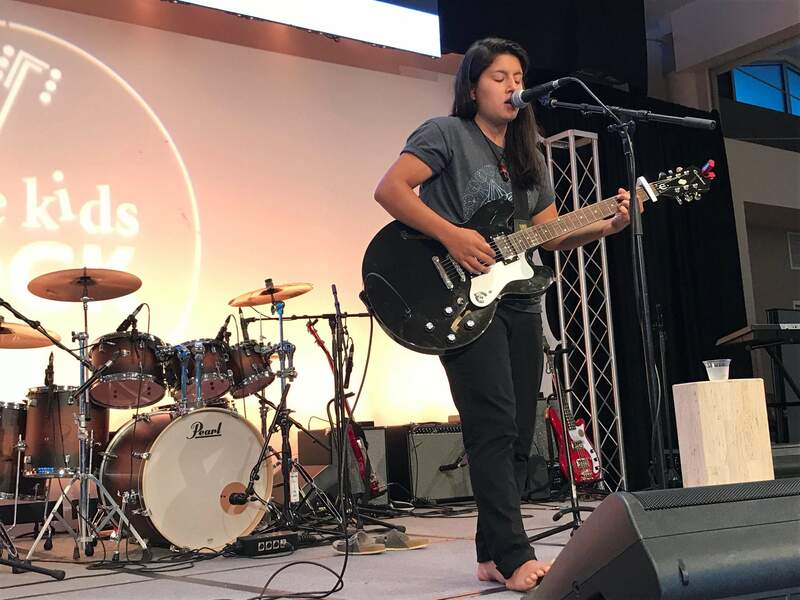 More than 500 educators from across the United States gathered July 7-11 at Colorado State University for the sixth annual Modern Band Summit, presented by Little Kids Rock in partnership with the Bohemian Foundation. Henke, 18, of Fort Collins, got her start with music thanks to Little Kids Rock. The program launched when she was in seventh grade at Polaris Expeditionary Learning School. “That’s when I fell in love with music,” Henke said. Little Kids Rock, a nonprofit based in New Jersey, helps get modern music into classrooms by training teachers. It also helps provide instruments for students who want to play. Jasmine Faulkner, Henke’s music teacher at Polaris, said the goal is to make music more accessible to every student. It allows kids to get involved even if they didn’t start playing an instrument when they were younger or didn’t get involved in orchestra or choir in middle school, she said. Little Kids Rock offers free professional development seminars to public school teachers across the country, instrument donations, lessons, curricula and other resources. At the workshops, educators learn how to teach modern band programs at their schools. Faulkner said the program changed her music class at Polaris. When the students liked the music they were learning – whether it was indie, metal or blues – they were more interested in learning it, Faulkner said. It worked for Henke, who learned how to play guitar, how to sing and how to write songs. For her senior project, she produced her own original album. Henke, who graduated this year, will study music at California State University Monterey Bay this coming school year. She wants to pursue a career in music. The program is often found in school districts where music programs have been cut or rural districts that can’t afford to have big music programs. In Poudre School District, Little Kids Rock supplements music programs already in place. Mary Claxton serves as Little Kids Rock’s Colorado director of programs. She’s also a former Polaris teacher and current drummer for the Greeley-based band The Burroughs. Claxton helps teachers and administrators come up with creative solutions to their challenges. Sometimes that’s as simple as connecting folks with the right resources, she said. She’s also working to facilitate a music business series that will help kids learn how to book gigs, how to talk to sound engineers, how to order songs in a set and more. The extra training can breathe new life into music programs for teachers and students. This year the summit offered more than 30 hands-on workshops on guitar, bass, keyboards, vocals and technology. Content specialist Kenrick Wagner hosted a workshop on hip hop. He had teachers rewrite hip hop songs and practice them in front of the rest of the group. The Little Kids Rock program helped Henke discover her passion and come out of her shell. Through music, she learned how to express herself and work with others. She still gets nervous when she performs, like she did in the CSU ballroom Monday. While she stood up there alone, her hands still shook a little. But when she started playing in front of all those teachers, her nerves faded away.